If you follow the expiry dates on your food, you could be throwing out almost 40 percent of what you buy each month – the average person throws out a shocking total of 20 pounds of expired food each month. However according to Grist, food date labels that say things like ‘best-before,’ or ‘enjoy by’ are just guidelines from the growers or manufacturers that say when their food will remain at its best – it’s often fine for eating days or weeks past the date marked on the label. Bump Mark is a new food label that could change all that. 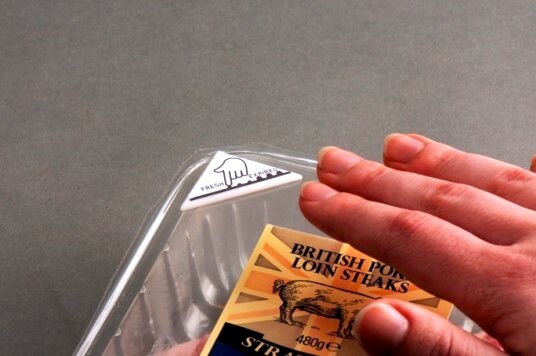 Made of four different layers from top to bottom, including a layer of plastic, gelatin, plastic bump sheet and another layer of plastic film, Bump Mark decays right along with your food to indicate when it’s no longer good. As the gelatin layer in the label decays with your food, eventually all that’s left to the label is a bumpy layer that indicates your food is no longer good and should be thrown out. As long as it’s still smooth to the touch, your food is fine to eat. What’s more, the label can be matched to just about any food by simply changing the concentration of gelatin so it will degrade at the exact same rate. “You can actually adapt this to any kind of product,” Pakstaite told the Washington Post. If widely implemented, this brilliant design could go a long way to reducing the extraordinary food waste that occurs globally, and help feed up to one billion people. Bump Mark expires right alongside food. Bumps tell you when food has expired.